Investing In Park Place Residences at PLQ: Over-Hype or Sound Investment? The market seems to be back. All 3 major launches, Grandeur Park Residences at Tanah Merah, The Clement Canopy at Clementi and Inz Residences EC at Choa Chua Kang have all seen brisk sales within the 1st weekend of their launch. More and more buyers are thronging the show flats. Those have been on the sidelines for the past 2 years are now weighing their options if they should be entering the market now. Coming up this month, the next project to be launched will be the much-hyped Park Place Residences at PLQ. This is a mega integrated project that sits right beside Paya Lebar MRT Interchange. Many people are calling this a superb piece of property to invest in. Or is it simply overhyped? You have your normal condominium developments, mixed developments and then there are integrated developments. The latter being the rarest. Including Park Place Residences at PLQ, there are only 9 truly integrated developments in Singapore. Including Park Place Residences at PLQ, there are only 5 such integrated developments that have Grade A offices in the mix. The other 4 are namely Wallich Residence at Tanjong Pagar Center, Marina One Residences, Duo Residences and South Beach Residences. There are limited plots of prime land next to an MRT interchange. A premium will naturally come attached due to the high demand for such prime locations. The demand will only be expected to get higher as the area becomes more developed. In times of economic downturn, no landlords are spared from the declining rents. For some landlords, they may even have to suffer months of vacancy before they can find any tenants. Data have shown that rents for developments near an MRT station and a shopping mall showed more resilience compared to the rest. Needless to say, when the economy turns up, the best-located properties will be the most in demand and thus will see the best take up rate and command the best premium for rental in the area. Situated in a location that has Grade A office next door, integrated with an MRT interchange and within 10mins travel to CBD, one can safely assume that Park Place Residences at PLQ as a rental property is probably as good as it can get. Paya Lebar Central is 1 of 5 key growth regions earmarked by the government for development in line with their decentralisation plans. While Jurong East is touted as the 2nd CBD, Paya Lebar Central will achieve a similar effect in the eastern region of Singapore. In time to come, it will be a bustling, integrated commercial centre with offices, retail and attractive public spaces flowing with activity. About 12 ha of land in the area is available for development. This translates to approximately 500,000 sqm of commercial floor space. A public plaza next to Paya Lebar MRT interchange will inject even more buzz into the area. This will become a focal point for activities as well as a gathering space for MRT commuters, shoppers and the office crowd. A signature image will thus emerge for Paya Lebar Central: a popular open plaza framed by the bustle of offices, shops and well-designed public spaces. If you can envision this transformation taking place (which is slowly happening since 2012), you would want to take up a position before the transformation is complete. 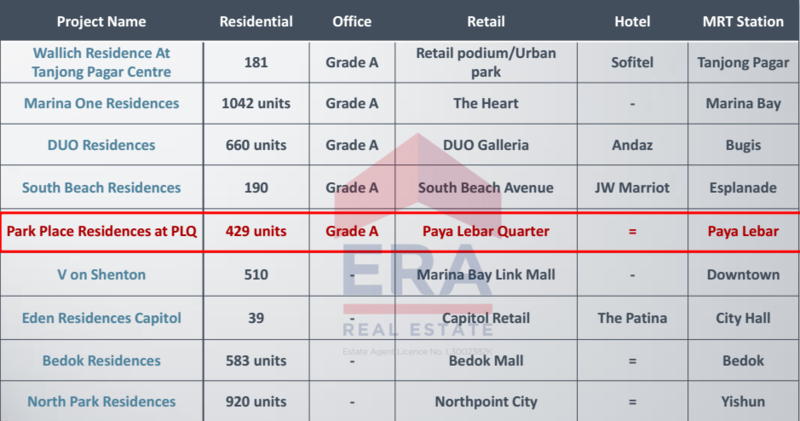 There is a total of 429 residential units for sale in Park Place Residences at PLQ, consisting of 1 to 3 bedrooms units. From the indicative prices, you can expect to pay approximately 1600psf – 1800psf. Is this a reasonable price to pay? As an investor, you make money when you buy right and also have your exit strategy planned. Today’s hotspot can be tomorrow’s overheated market. In order to make a gross profit of $100k, you will need to sell at $1,818psf. And if you buy in at $1700psf, you will probably need to sell at $1,900psf. Is this price level sustainable at the moment? J Gateway would be a very good case in point. Nobody has a crystal ball to tell you what’s going to happen in 5 years time. Your ability to exit at this price point will very much depend on the general economy recovery as well as how the prices in core central region performs. Park Place Residences at PLQ does check the boxes as an investment grade property. The location is impeccable, the project is of top quality and is a rare integrated development. Plus it is situated in an area that is earmarked for growth and transformation by the government. It is indeed a rare opportunity to own such a piece of property and if you miss this chance, there are no more plots beside the Paya Lebar MRT interchange. The only call for caution is that the investor should have an investment horizon that goes beyond 5 years before they can realise any meaningful gains. To find out more about Park Place Residences at PLQ, click here. Do you like what you read? Do follow us on facebook to get the latest updates on the Singapore property market.